In my Central California practice, I see many young Hispanic patients with diabetes. Often these working-age individuals struggle to maintain optimal glucose control, and they go on to develop bilateral disease. In my primarily agricultural region, I treat a number of migrant workers who lack stable health insurance and may have additional challenges. It is important to consider the big picture of each patient’s overall health and situation in life when I establish a treatment plan. I want to use the fewest anti-VEGF injections while achieving the best visual outcomes; I seek to lessen the burden of therapy in any way I can. In this article, I offer reasons to reconsider laser therapy in the treatment of your patients with diabetes. • Laser therapy may some allow patients to prolong the time intervals between visits, decreasing the burden of treatment on patients, the practice, and the health care system. • By employing a combination of treatments—anti-VEGF therapy and steroid injections, laser, and pars plana vitrectomy—we can decrease the overall long-term treatment burden on young patients with diabetes receiving anti-VEGF injections. Until anti-VEGF therapy took over the scene 10 years ago, focal/grid laser photocoagulation was the standard of care for treating macular edema and reducing the risk of vision loss in diabetic retinopathy. And even though the ETDRS established a gold standard in the classification and treatment of diabetic retinopathy and diabetic macular edema (DME) photocoagulation laser treatment has by now been largely replaced by intravitreal drugs. Today, however, we have access to more advanced tissue-sparing laser technology that can treat diabetic disease by creating thermal stress without causing collateral damage. Tissue-sparing treatment has several advantages: It causes no scotoma or scarring, it can target foveal areas, and it can be repeated. 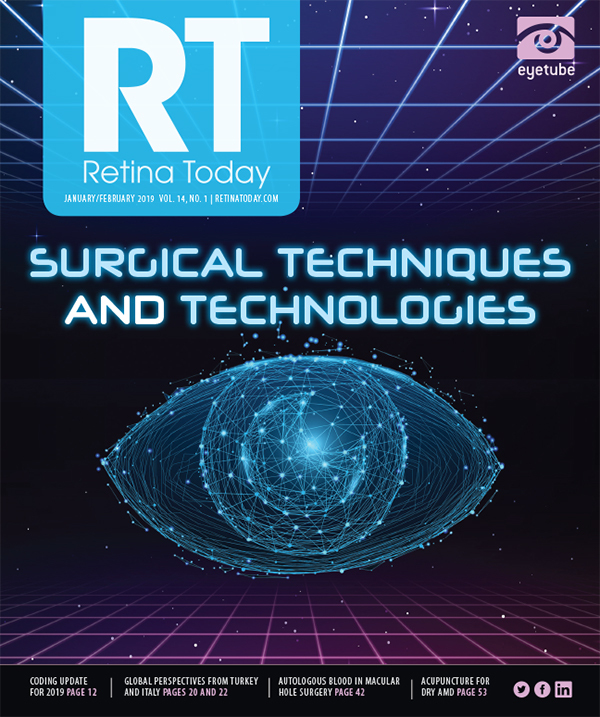 Developments in this technology, such as Endpoint Management (Topcon), MicroPulse photocoagulation (Iridex), and the Navilas Laser System (OD-OS) have also improved the titratability and expanded the application of tissue-sparing laser. For the purpose of this article I will share my experience using Endpoint Management with the Pascal laser (Topcon) in the green 532 nm wavelength. With Endpoint Management technology, the surgeon applies laser energy to produce a barely visible retinal lesion, and the amount of energy directed to the retinal pigment epithelium (RPE) is then exactly titrated. The laser algorithm applies the laser energy with tissue-sparing settings. In my hands, Endpoint Management with the Pascal laser has provided nondamaging results. By employing laser treatment within these parameters, we can use high-density patterns to enhance clinical efficacy. This approach is also associated with little to no discomfort for patients, and it is quicker than previous methods. In my experience, patients are therefore highly satisfied with their treatment. For patients with nonfoveal DME, I favor using Endpoint Management alone. For those with DME involving the fovea I use Endpoint Management in conjunction with monthly anti-VEGF injections. Because I want to see a trend toward decreasing central macular thickness (CMT), I closely monitor OCT to evaluate the patient’s response. Many factors can cause thickness on OCT, so it is crucial to correctly identify edema. I use fluorescein angiography (FA) and OCT to differentiate between leaking vascular disease and other causes of macular thickness. For my patients with center-involved DME, I perform baseline FA and OCT and administer an anti-VEGF agent with a loading dose of six injections. If repeat FA and OCT show that CMT is not trending in the right direction, I add a steroid. I seek to extend the treatment interval once I achieve the desired response. At this stage, I perform Endpoint Management laser treatment and continue with a treat-and-extend strategy for the anti-VEGF injections. If there is a clear component of vitreomacular traction or macular puckering, which will compromise the anti-VEGF treatment effects, then I consider pars plana vitrectomy. A recent study evaluated Endpoint Management treatment of DME using the Pascal Streamline yellow laser (Topcon) in 10 eyes.1 Entry criteria included CMT ≥ 300 μm and VA ≤ 0.5 (Snellen decimal). The primary endpoints were VA (logMAR) and CMT at the 6-month follow-up visit. Secondary endpoints included fundus autoﬂuorescence, macular volume, and macular sensitivity. At 6 months after laser treatment, CMT had significantly decreased in the 10 eyes with no signiﬁcant changes in macular sensitivity, mean BCVA, or macular volume. Autoﬂuorescence imaging revealed no changes in six of 10 eyes, and no eyes showed subjective symptoms of scotoma after treatment. On OCT, four eyes showed complete resolution of DME after a single treatment, and macular sensitivity was increased in these eyes at 6-month follow-up. The authors concluded that subthreshold photocoagulation using Endpoint Management was safe and effective for DME treatment and preserved macular sensitivity. By employing a combination of treatments—anti-VEGF therapy and steroid injections, laser, and pars plana vitrectomy—we can decrease the overall long-term treatment burden on young patients with diabetes receiving anti-VEGF injections. Laser therapy may allow some patients to prolong the time intervals between visits, decreasing the burden of treatment on patients, the practice, and the health care system. 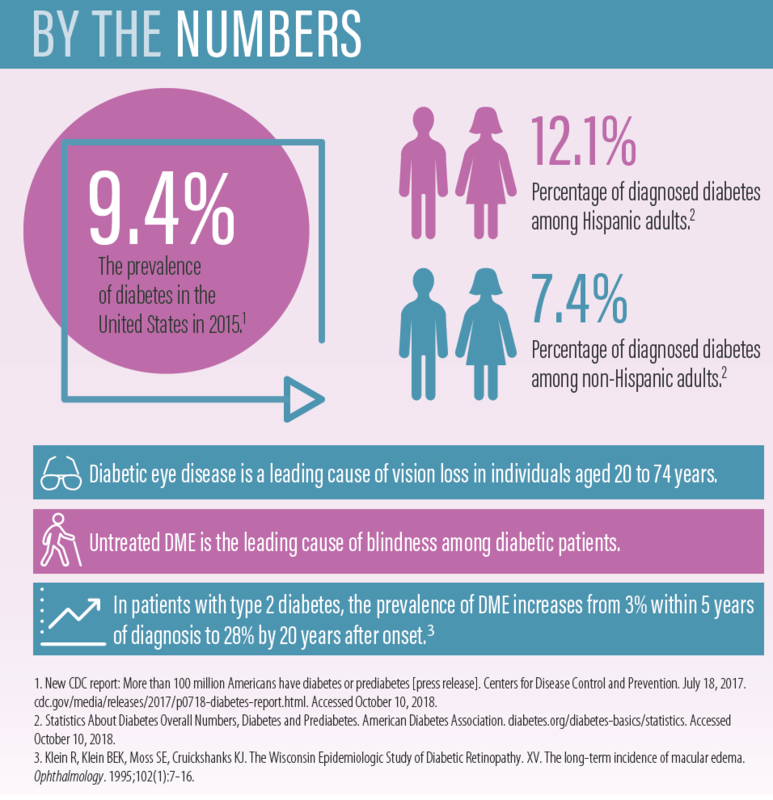 In my practice, I continue to see more and more young, working-age individuals with diabetes who have a background of poorly controlled diabetes and bilateral retinal disease. The backdrop for many of these patients includes a lack of stable medical insurance. It is incumbent on physicians to devise effective strategies that allow us to prolong the time between patients’ visits to our offices. We cannot forget the big picture for our patients; we must understand the nature of their lives in order to create treatment plans they can adhere to. I believe that, in moving away from a chronic need for anti-VEGF injections and adding laser therapy to the treatment algorithm, we can make the lives of patients with DME a little less complicated. 1. Hamada M, Ohkoshi K, Inagaki K, et al. Subthreshold photocoagulation using endpoint management in the PASCAL system for diffuse diabetic macular edema. J Ophthalmol. 2018:7465794.